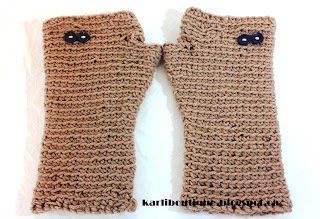 The latest craze all over the web is fingerless gloves or wristwarmers. There are many other names for these cuffs, can you think of a few more? Part of the allure may come from the fact that you can still wear them inside AND you can still use your touchscreen phone outside. Of course, these are only suitable for cooler temperatures and not freezing weather!! Still, they make such a fashion statement. I made these up last night, just a simple and basic pattern to get the measurements needed for further embellishment. A very unique cabled pattern using chain stitches to create easy "crochet cables"